As my colleague Mark Krikorian has stated: "Weakening the magnet of jobs is key to deterring illegal immigration." This is hardly profound, but it is the fundamental truth of immigration enforcement. Most aliens come to the United States illegally seeking employment, and if they can't get employment, they won't come. It seems U.S. Immigration and Customs Enforcement (ICE) has learned this lesson, and is taking steps to weaken that magnet. More must be done, however. The homeland security investigations [HSI] unit of [ICE] said the employees of CVE Technology Group Inc. in the city of Allen, north of Dallas, were arrested on administrative immigration violations and that they were working in the United States unlawfully. Such "raids" are an essential component of worksite enforcement, a subject on which I have a certain level of knowledge and experience. I started my legal career as a law clerk in the Executive Office for Immigration Review (EOIR) the Department of Justice (DOJ) component with jurisdiction over the adjudication of civil worksite enforcement charges under section 274A of the Immigration and Nationality Act (INA). Worksite enforcement was a critical component of the Immigration Reform and Control Act of 1986 (IRCA) — section 274A was an element of that act. IRCA is often called the "1986 amnesty" for good reason, because the most successful element of it was the legalization of 2.7 million "beneficiaries", as the Washington Post has termed them. In a touch of humor that one does not usually expect out of the Post, the author of that article noted that IRCA "sought to create a definitive solution to immigration (that, obviously, did not pan out)." Respectfully, worksite enforcement was doomed from start. In 1986, the then-Immigration and Naturalization Service (INS) lacked the technology to effectively enforce the employer-sanctions provisions of IRCA and, as it relates to enforcement, not much has changed since then. Within three days of hire, an employer and employee were to complete a government form (the Form I-9) to verify the employee's employment eligibility. In conjunction with completion of that form, the employer was to review one or two documents from a list of acceptable documents that would establish the employee's identity and employment authorization in the United States. Those forms were then stored until the INS came and asked for them. Of course, the biggest flaw was the availability of fraudulent documents to establish identity and employment eligibility. HSI is the principal investigative component of the Department of Homeland Security [DHS]. ... HSI's international presence represents DHS' largest investigative law enforcement presence abroad. HSI conducts transnational criminal investigations that protect the U.S. against threats to its national security and brings to justice those seeking to exploit U.S. customs and immigration laws worldwide. HSI has broad legal authority to investigate all types of cross-border criminal activity. Although the job description is necessarily broad, "worksite enforcement" is not specifically mentioned. It is probably tough in this economy to find a brilliant young mind that wants to flip through dusty employment documents. Returning to the point, however, there are only a handful of agents to do worksite enforcement, notwithstanding the fact that it is a White House priority, as expressed in Executive Order 13788, "Buy American and Hire American". Frankly, however, the resources dedicated to this task today are not terribly lower than they were in the past. When I was in the San Francisco District Office of the INS, I was one of two attorneys assigned to worksite enforcement cases, and we both also handled a significant portion of the detained removal proceedings docket. And then the other attorney left, leaving me the only attorney handling worksite enforcement cases for two-thirds of the most populous state in the nation, and even then it was a part-time responsibility. As I noted, the United States lacked the technology in 1986 to enforce the worksite-enforcement requirements of IRCA. That is not true today, however. 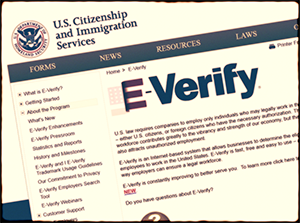 Thanks to E-Verify, "an Internet-based system that allows businesses to determine the eligibility of their employees to work in the United States by comparing an employee's Social Security number and other information against millions of government records", employers can verify the employment authorization of their employees in almost real time. To make clear: Worksite enforcement actions, such as that which occurred at CVE Technology Group Inc. are a critical component of our nation's immigration-enforcement efforts. As Krikorian has correctly stated, however: "Only by making E-Verify a universal part of the hiring process can we even begin to claim to be serious about enforcement." And, in the president's October 2017 "Immigration Policy Priorities", he stated that he would require E-Verify. But he hasn't done so yet. In a December 2018 post, I explained how the president could do so through executive action. Tucker Carlson specifically asked Homeland Security Secretary Kirstjen Nielsen about taking this action during her appearance on his program on April 3, 2019, but she sidestepped the issue, making it clear, as Fox News has reported, that "everything was being considered." Respectfully, it is time for the president to at least make the threat that he will mandate E-Verify. This will likely result in a hue and cry from proponents of cheap labor in the American economy, but then many of the president's threats do, and that hasn't stopped him yet. This is not simply an immigration issue. If employers can hire illegal workers with virtual impunity, the wages and working conditions of Americans (both citizens and immigrants lawfully present in the United States), and especially the most disadvantaged Americans are adversely affected. Immigrants unlawfully present in the United States lack the bargaining power to demand higher wages, or to insist on the same level of safety in the workplace, that a worker with the full rights of a citizen or lawful immigrant and would have. The Center is often described as "hard-line" on immigration. Recognizing that there's no fairness in this world, this is still an unfair characterization, unless those who insist on the enforcement of any other law of the United States are similarly characterized as "hard-line". I, for one, strongly oppose the exploitation of any human being for any purpose, hardly a hard-line position. Such exploitation, however, is the natural result of a lack of enforcement of our worksite-enforcement laws. HSI has demonstrated a willingness to stop such abuses. The president should follow their lead and mandate E-Verify. This would shut off the magnet, stop the abuses, and make enforcement of all of our immigration laws, including those involving border security and the overstaying of immigrant visas, all the easier.